EVSE LLC, a subsidiary of Control Module Inc., is a leading designer and manufacturer of smart EV chargers for the workplace, parking facilities, public locations, fleets and multi-dwelling residential units. Our revolutionary, patented automatic electronic cable management system solves common challenges associated with electric vehicle charger cables. By preventing them from lying on the ground, our patented system reduces liability from tripping hazards and prevents damage to connectors. When the EV cable management system is activated, the electric car charger cable is released for use. When the connector is removed from the electric vehicle, the cable and connector automatically retract into a compartment, where they are protected from damage by vehicles, weather and vandals. This retraction capability also helps pedestrians avoid tripping accidents while ensuring compliance with both ADA and OSHA regulations. 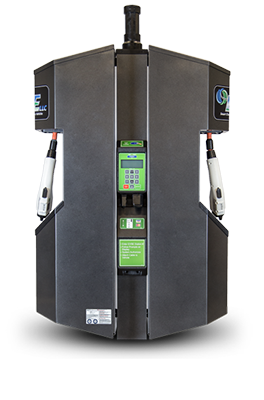 EVSE LLC’s electric car charging products provide flexible and secure access that can be custom-tailored to your needs. Why add a new payment or access method to your electric vehicle charging project when you can use what is already in place? Our EV charging station platform can utilize existing ID cards and existing parking tickets issued by parking gates. Mounted to the ceiling overhead, the EVSE LLC Garage Overhead Electric Car Charger is ideal for both public and private garages. 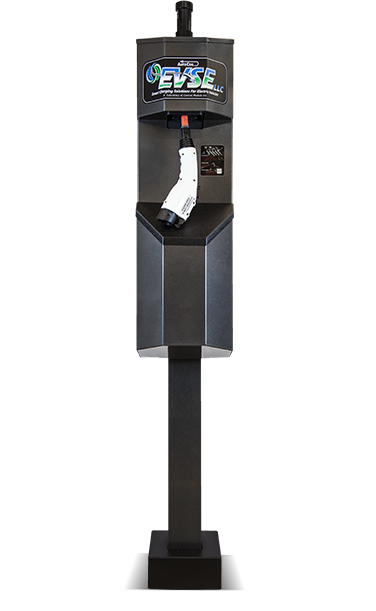 The 3704 AutoCoil Electric Car Charger offers Level 1 and 2 capability and is available in wall-mounted and single- or dual-pole mounted versions. Both feature our proprietary cable management system that ensures OSHA compliance at the workplace, which mandates keeping live cables off the ground. Our cable retraction system ensures that the EV charger cable is automatically stored within the unit when not in use, preventing damage caused by weather, other vehicles and vandals. This revolutionary system also protects pedestrians from potential tripping injuries. Installation does not require poles or barriers that reduce ADA compliance.